3-D printing using plastic is what we normally read about. That, however, has not deterred curious minds from exploring other materials. While the 3-D printing of auto parts has been interesting in and of itself, luxury car makers are fond of imaginative ideas that step beyond the norm. 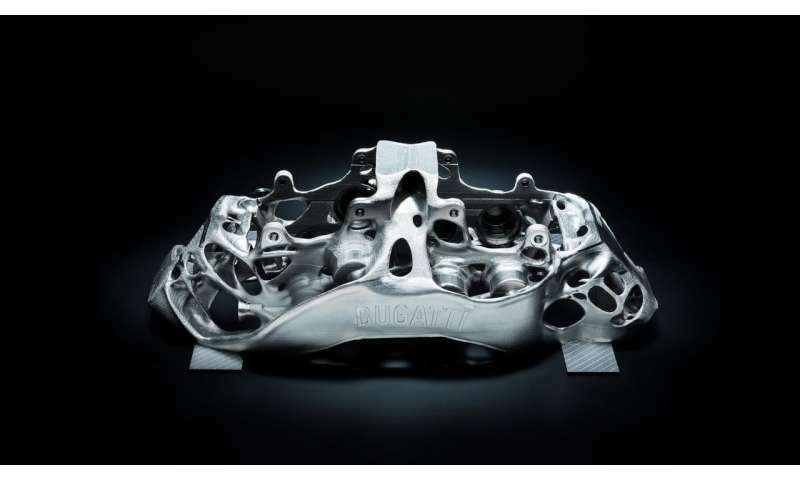 Bugatti, for one, has gone ahead to 3-D-print brake calipers out of titanium. This material is titanium alloy with the scientific designation of Ti6AI4V. Aerospace uses it, in undercarriage and wing components and rocket engines. It is not difficult to suspect that 3-D printing using titanium for the car component would be difficult. Top Gear put it simply. "3-D printing has been around for a good while now, but it usually relies on specific polymers or easily sintered metals (a complex term that means heat-forming without melting). And you might have to consult a very clever person for this next part, but titanium is apparently quite difficult to manipulate in a 3-D printer." Then why venture printing with titanium? Just to justify high asking prices? Ryan Whitwam in ExtremeTech offered a technical reason instead: At such top speeds, "You had better hope the brakes are similarly well-engineered. For a car racing at a few hundred miles per hour, he said, it makes good sense "to have the strongest caliper material possible." Titanium, he said, is incredibly strong. "A single square millimeter of the chosen titanium-aluminium-vanadium alloy can support 125 kg of mass (275 pounds)." Bugatti's press statement talked about strength. As a 3-D printed component, it has a tensile strength of 1,250 N/mm2. "This means that a force of slightly more than 125 kg be applied to a square millimetre of this titanium alloy without the material rupturing." For Chiron, the new caliper material represents a replacement in the future from aluminium versions. The new titanium parts are 40 per cent lighter, and stronger, said Matt Robinson in Car Throttle. Road & Track walks readers through the printing process that takes 45 hours to print, "during which 2213 layers of titanium powder get melted together by the lasers. Following the completion of the final layer, the remaining titanium powder is removed from the chamber, cleaned and preserved for reuse in a closed loop. What remains in the chamber is a brake caliper complete with supporting structure which maintains its shape until it has received stabilizing heat treatment and reached its final strength." According to Bugatti, "Heat treatment is carried out in a furnace where the brake caliper is exposed to an initial temperature of 700°C, falling to 100°C in the course of the process, in order to eliminate residual stress and to ensure dimensional stability. Finally, the supporting structures are removed and the component is separated from the tray. In the next production stage, the surface is smoothed in a combined mechanical, physical and chemical process which drastically improves its fatigue strength, i.e. the long-term durability of the component in later vehicle operation. Finally, the contours of functional surfaces, such as the piston contact surfaces or threads, are machined in a five-axis milling machine which takes another 11 hours to complete its work." The company said "The first trials for use in production vehicles are due to be held in the first half of the year; the time schedule is still to be finalized." They should save their money to buy Teslas.